Today we're going to review a Hi-End sound card. 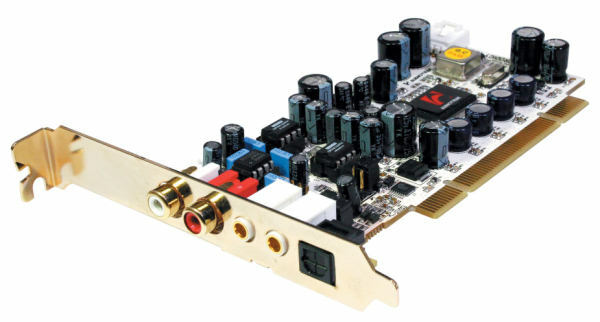 This product was the first Hi-End card to use a top DAC from AKM and high quality additional components. Prior to this product, top DACs used to be installed only in expensive limited-edition studio cards for $1000 and higher, such as LynxTwo, ProTools HD, etc. Along with high quality components, the card uses multifunction drivers. The price of the ProdigyHD2 Gold on the Russian market is quite acceptable - about $180 including shipment fees to deliver the card from Japan. Delivery time is about one month. As far as we know, Audiotrak offers two cards for the European market - Prodigy HD2 (without Gold suffix) and Prodigy Hi-Fi. These cards may appear on our market as well. The low-profile card can be installed into a stylish and small HTPC with other Hi-Fi/Hi-End components. The most difficult problem will be to choose a noiseless PSU for your low-profile PC case, because they have non-standard dimensions. You might want to use a PSU as a stand-alone unit, so that you could choose any PC case you like and any PSU installed in a well ventilated place. If you choose a PSU with removable cables, you may make then longer and put inside a shielded pipe. A low-profile bracket is included into the bundle. The Prodigy HD2 Gold contains high quality opamps for the line-out with the Triple OPAMP technology - two OPA2134 from Burr-Brown + JRC5532. 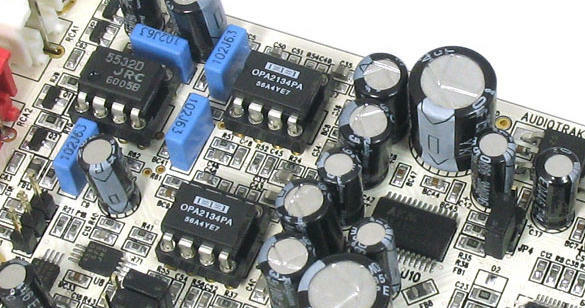 Dip connectors allow to replace opamps without soldering. Headphones-out is based on two JRC4580 chips that provide the output power of 120 mW. The card for the European market (Prodigy HD2) uses the NE5532 instead of the OPA2134. Thus, you can replace the NE5532 with the OPA2134 for $16-20 to upgrade your card to the Gold edition. The only competitors of our card under review are new Auzentech cards on CMI8788 and the Auzen X-FI Prelude 7.1 to be launched this year. The ADC offers mediocre parameters just like common sound cards - X-Fi, Revolution5.1, Prodigy7.1. This quality level is quite enough to digitize an external TV tuner, radio, etc. By default, the card comes with reference drivers from VIA. They look user-friendlier now than earlier versions of reference drivers from VIA. The drivers offer two modes - dual channel mode and Digital In (the card does not have SPDIF IN as such). Universal drivers always have funny bugs. The Digital In mode only activates line-in monitoring in this card, sending a stream to the analog output. Analog input level cannot be controlled. Besides, the analog input can be activated only when the sound card is not used by any program. Otherwise, you'll see an error message. Having activated SPDIF IN, the audio stream does not go from the DAC to the output. So you can listen to either DAC or line in. The card can always digitize audio from the line-in. It's inconvenient that RCA/HP cannot be controlled separately. And you have to use a jumper to amplify the headphones-out signal by 250%. The Prodigy7.1 does it with a software-controlled relay. On the other hand, the relay resulted in higher channel crosstalk. So the relay was replaced with jumpers to increase audio quality. Note the sample rate automation, which can be disabled. QSound (3D sound in games, equalizer with timbres and reverberation) is available only for 64-bit systems - an unobtrusive hint to upgrade. There is no game support. It means that there may be no sound in games, or some samples may drop out. Sound processing will be mediocre. It's like you when have a new GeForce, but it plays as if it's an obsolete Riva TNT. The state-of-the-art sound algorithms use X-Fi now. Advantages of the X-Fi will not be used only in those games, where sound is processed solely by a game engine, no features of the sound card driver being used. Thief III has an option to activate sound card hardware features. For example, E-MU1616m with hardware acceleration enabled plays only a couple of audio streams, like Garrett's steps, and produces no background town noises, guards' dialogs, etc. Speaking of the Prodigy HD2, the sound just disappears. When hardware acceleration is disabled, both cards produce all the sounds. This example shows that there may be no sound problems in some games at all. But you may come across games, which have problems with detecting hardware acceleration. It's impossible to test all games with all patches, you can only lower the risk by using a gaming sound card. 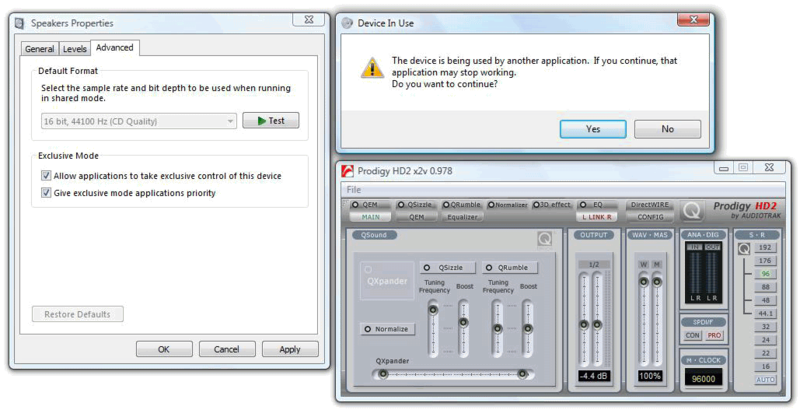 Audiotrak has recently offered a new driver for Prodigy HD2 from the Prodigy7.1/Hi-Fi/XT family. To install it, you'll have to re-flash the card. Prodigy drivers are a successful attempt to create a multimedia card with drivers from professional cards. We can mention only Creative multimedia cards with KX-Project drivers that offer a similar professional level. 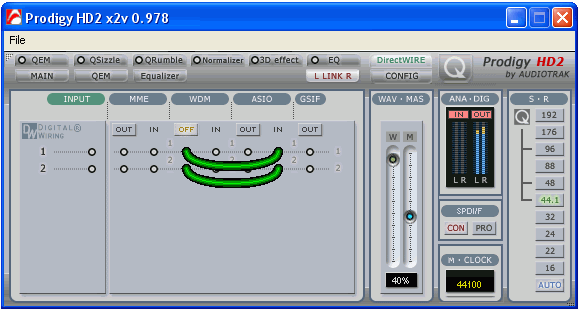 KX-Project also uses hardware DSP resources. Prodigy cards shoot forward owing to no support for 44.1 kHz mode in the KX. We'll see whether the KX evens the score in future. As for now, the Audigy2 Value and the Audigy4 supporting the 44.1 kHz mode with KX have some limitations. The Prodigy driver offers additional interesting features. QSound support in all systems. DirectWire panel with flexible signal routing. These drivers look little different from Prodigy7.1 and XT drivers. 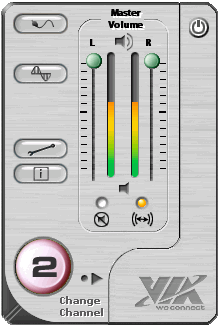 To fill the empty space in the Main tabbed page, the developers moved QSound options there and destroyed the "audiophile look" with its "no-processing concept". Line-in monitoring is located in place of Digital in. 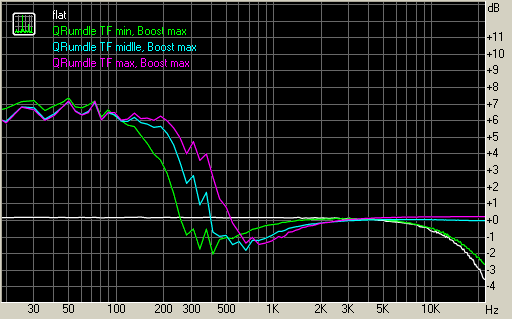 Unlike the reference drivers from VIA, there is no SPDIF level control. 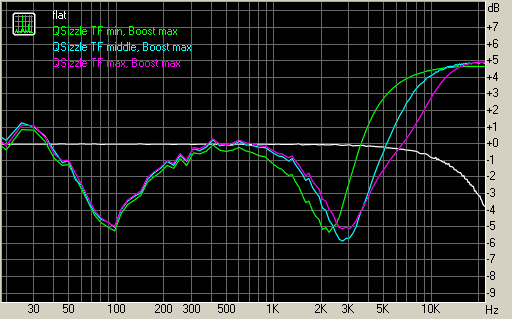 Raising the output 1/2 level to +3 dB does not overload the system and there is no clipping. This reduction has been done to fine-tune the signal level for consumer equipment. Taking positioning of this card into account, we'd prefer the drivers to look like those for MAYA44 or Juli@. New drivers always have some bugs in them. After our experience with the ESI MAYA44, Prodigy7.1 and updated drivers, we expected similar problems with the ProdigyHD2. We were right to expect them. But do not be too hard on the current version of the drivers, as many problems will be fixed in future releases. We do not describe these problems to mark this card down, we only warn you about possible problems. When you review each problem, you should evaluate its relevance. Before you buy a card, you should inquire about new driver versions and fixed bugs in forums. 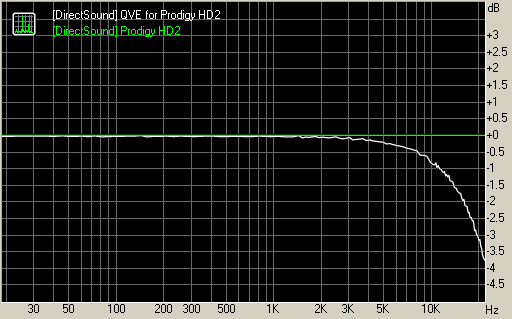 QSound mode (QVE for Prodigy HD2) often shows a HF cut in the frequency response curve. 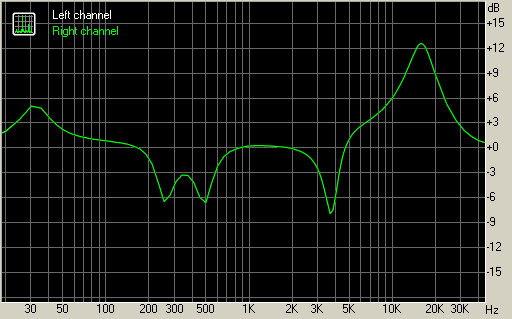 Interestingly, this cut may appear only at the DAC output, the frequency response curve of the SPDIF being "straight". It's caused by the "Enable High Frequency (40 kHz)" option in the config tabbed page. When this option is not enabled, there appears a HF cut. However, enabling this option does not always guarantee that you'll have no cut. Quite opportunely, the card has a line-in to monitor how the card works in the RMAA test. Many audiophiles are of the opinion that such cards do not need line-in, that it just makes these cards more expensive. It's not very easy to detect such driver bugs by ear. It's much easier to run a minute test, which is not affected by your mood and auditory acuity. Now let's turn to QSizzle and QRumble. QSizzle is responsible for raising high frequencies, it also allows to adjust frequency and amplification levels. Unlike the usual timbre and EQ, there are crevasses at 100 Hz and 2-3 kHz. QRumble works as a LF timbre. Pay attention to the HF cut - it appears and disappears, "Enable High Frequency (40 kHz)" being constant. 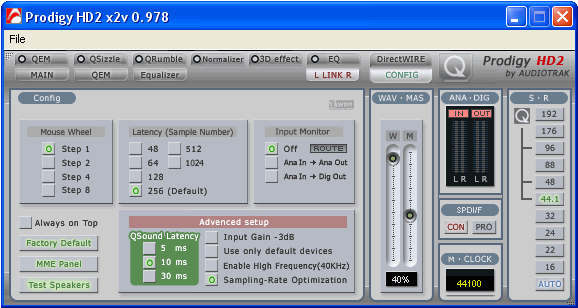 The control panel allows to specify latencies for ASIO and QSound. DirectWire (the second name of Digital Wiring) allows to re-route the audio stream between the interfaces. One of the plain advantages of DirectWire is to change left and right channels for recording. DirectWire and professional software may help you process any signal in real-time, regardless of the source player. EQ with notch filters may come in handy for Hi-End systems - to suppress environment modes at low frequencies. The operating system detects this card as two devices - Prodigy HD2 and QVE for Prodigy HD2. QSound is not notable for high quality, it outputs less natural effects and sound positioning. But at least all sound streams are in place. Cards supporting QSound, Sensaura and Xear3D (crippled modification of Sensaura in CMI cards) process audio much worse than X-Fi cards. We do not compare EAX versions here, just processing algorithms, which are much better in the X-Fi even in non-EAX games. So if a game supports a non X-Fi card, you should take it as a bonus, something like compatibility with games that offer cut-down features and poor quality. ASIO was a pleasant surprise. As you can see in RMAA diagnostics, we have four channels at the output instead of two. Unlike Revolution5.1, these channels are really working. These additional channels control SPDIF output. SPDIF duplicates the DAC stream in WO/DS/KS modes. When you start any ASIO application that uses all ASIO channels, SPDIF duplication is disabled. This SPDIF feature is available only in professional cards. So the card will do fine not only for home projects, it also offers some professional bonuses. 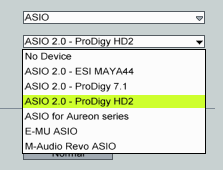 That's why the Prodigy HD2 looks more like a professional card for a home studio with a medium quality ADC, high quality DAC, and consumer connectors. Vista detects this card as three devices. 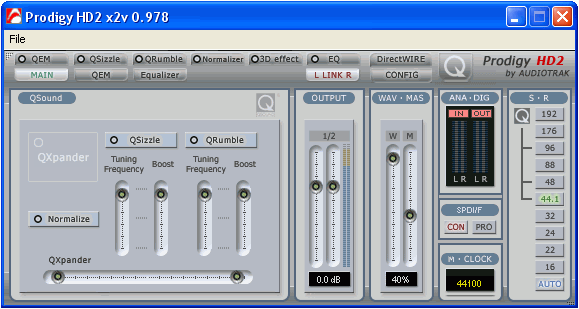 Just like in case of the Prodigy7.1, effects do not work in QSound mode. The card supports all frequencies. Vista does not have sample rate automation. 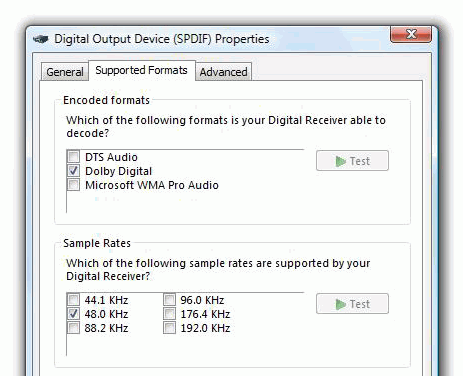 Microsoft just offers to select the sample rate and bit depth, which must be detected by the sound card. This solution brings nothing but headache to its users. Microsoft has its own opinion on the "right" sound in Vista. It will take time to change it to something more adequate. NT systems had similar problems, which also took some time to get better. Fortunately, the card supports ASIO. Sample rate automation works fine in this mode. We've found another annoying problem - if the rate specified in the control panel does not match the rate specified in Vista, the operating system cannot use the card. XP allows to disable rate automation in the control panel and specify a necessary rate manually. You cannot do it in Vista, the "auto/lock" button does not respond to clicks. To solve this problem, you should play a track with a necessary sample rate in ASIO, or set the sample rate in Vista to the sample rate in the control panel. But sometimes automation works, and the card switches to the sample rate specified in the control panel. The situation is not that bad compared to other cards - for example, the Revolution5.1 in Vista supports only 44.1 kHz, the other rates work only in ASIO. 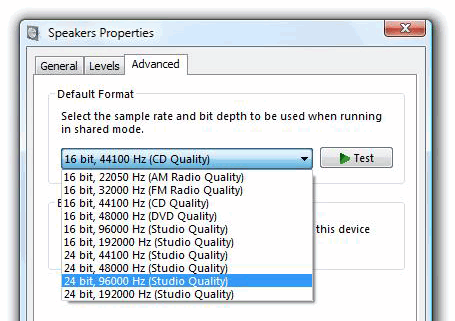 So, Revolution5.1 will downsample sound to 44.1 kHz practically in all players. RMAA measurements are quite low. It has to do with low Loop values because of the ADC. 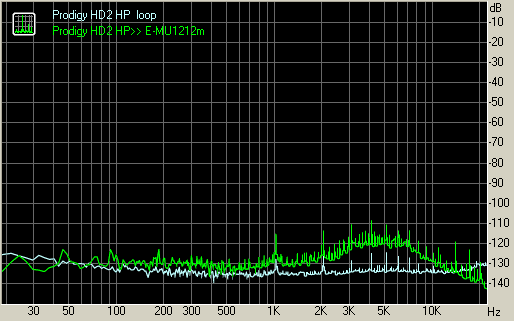 And the spectrum shows additional noises, when tested via other cards. High noise is registered not only in the test with the E-MU1212m, but also with the E-MU1616m and the Lynx Aurora8 - the latter have external power supply. To check it up, we have run the E-MU1616m >> Lynx Aurora8 test - we've got clear spectrum even with a usual non-balanced cable. The other cards (X-Fi Elite Pro and Juli@) were also tested in the same system unit. The Juli@ shows a clean spectrum, the X-Fi Elite Pro - dirty. These noises are most likely caused by non-optimal layout of the ground. When connected to another device, all noises do not go to the ground, but through analog outputs to the ground of the other card. The E-MU1616m has a special ground screw on the external unit to flush all noises down to the ground, by-passing analog inputs. If a tested device does not have a similar ground connector, it won't be able to suppress noises completely. This can be illustrated by plugging computers to different mains sockets. If a mains socket is not grounded, a discharge may burn your card's inputs and outputs, when you hot-plug it. It happens a lot. You should also pay attention to PC cases - they are often made of riveted thin metal sheets. Grounding in these PC cases is highly inefficient, even if you have a high quality PSU. We'll review this problem in detail in a separate article. My point is that you can take readings with minimal noises, but it does not mean that the problem is gone on its own. Have a look at the Prodigy HD2 >> E-MU1212m readings. The noise level rises at 5 kHz. Then we plugged the Behringer A500 amplifier to the cards with it volume set to maximum. It was a non-balanced connection for both cards. The microphone registered noises generated by the cards. We can see the same rise in the spectrum. The E-MU1212m catches fewer interferences. You can hear them only in gaps at high signal amplification. You won't hear the interferences in a common situation. That's the case when numbers do not reflect characteristics directly. So you should pay attention to spectrums only. 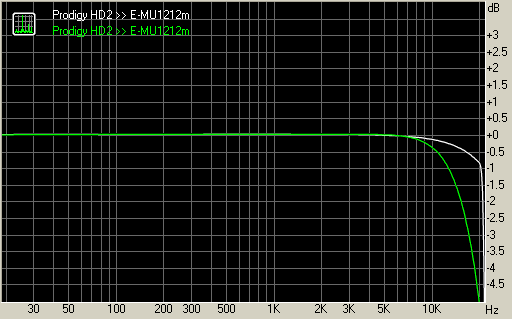 When we tested the ProdigyHD2 with the E-MU1616m, we managed to squeeze 110 dB versus official 120 dB. It's a good result. It must be also mentioned that the card was redesigned a little after the first revision. It may be a tad simplified. We also come to a conclusion that power filtering is implemented better in the E-MU1212m and Juli@, which do not use advertised technologies. You must understand that signal-independent noise does not affect signal quality. The E-MU1616m is a multi-channel professional card. Its audio quality is similar to that of the E-MU1212m, which has fewer input and output channels. So results of the E-MU1616m vs ProdigyHD2 comparison will be similar to that of E-MU1212m vs ProdigyHD2. The LynxStudio Aurora8 + LynxStudio AES16 is a complex solution - "digital card" + "external multi-channel DAC+ADC". The price is high owing to specific studio functions. Approximation of sound quality and price is not a good idea for professional cards. The LynxStudio Aurora 8 was used as a reference device and a switchboard to re-route signals to the ADAM S2.5A monitors. Tests were conducted by Maxim Liadov and Roman Kuznetsov. The DBT (double-blind test) shows that the E-MU1616m and ProdigyHD2 play on the same level. The difference in audio quality is insignificant. The Aurora8 sounds better, offering more details and a better attack. However, the difference between the Aurora8, the E-MU1616m, and the ProdigyHD2 is clearly noticeable only in some tracks. So does it really make sense to hunt after higher quality in hardly noticeable nuances? It's up to our readers to decide. This card is a high quality top product from Audiotrak. There is weak competition in the Hi-End market of sound cards, so the direct rivals are only the X-Fi Elite Pro and the E-MU1212m. Unlike the X-Fi Elite Pro, drivers of the Prodigy HD2 are more professional, and have a simpler control panel than for the E-MU1212m. What concerns games, the card fares in between high quality sound processing in the X-Fi and no 3D audio support in the E-MU1212m. Unlike the E-MU1212m and X-Fi Elite Pro, the ProdigyHD2 is a low-profile card, so it can be used in compact HTPCs. Another advantage of this card versus the 1212m is its built-in preamp for headphones.